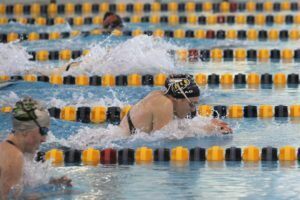 SCAD and Lindenwood-Belleville both put two swimmers in the final of the 200 back, taking spots from Lindsey Wilson and Keiser whose swimmers wound up in the consolation. SCAD freshman Gergo Zachar, who tied for the national title in the 100 back on Friday night, led the morning heats with 1:49.46. ONU senior Charles Bennett dropped 2.6 seconds to qualify second in 1:49.73. Loyola sophomore Trey James improved his seed time by 4.7 seconds and swam the morning’s third-fastest time (1:50.41). Cumberlands freshman Daric Sundeen (1:50.46) was just behind. 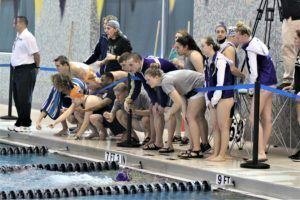 Also making the A final were Asbury sophomore Clay Bisher, Lindenwood-Belleville freshman Carolus Josefina, SCAD junior Brogan Bunner (who dropped nearly 5 seconds), and Lindenwood-Belleville freshman Santiago Baro. 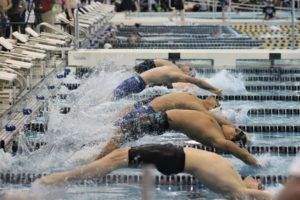 Leaving very little doubt as to who is favored to win the 400 free relay, Keiser slotted the A final of the men’s 100 free with four swimmers: freshman N’Nhyn Fernander, sophomores Marcel Nagy and Justin Lewis, and junior Andrei Stukov. Fernander and Nagy led the qualifiers with 44.83 and 45.01, respectively. The next two qualifiers came from Thomas University: Alex Haymond (45.19) and Perry Lindo (45.33). They finished third and second, respectively, in this event a year ago. SCAD freshman Zoltan Monori (45.48) qualified fifth, and ONU senior Guilherme Magnoler (46.36) made it in at the 8th spot. 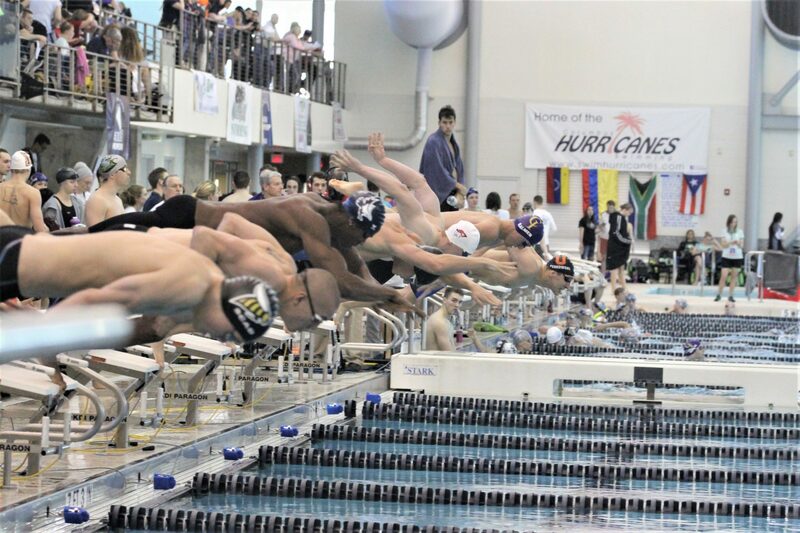 After winning the 200 IM on Thursday and the 100 breast on Friday, Keiser sophomore Lukas Macek is going for his third national title tonight in the 200 breast. He led the morning heats with 2:03.08, although he is the only swimmer entered in the meet with a sub-2:00. WVU-Tech’s Paulo Dias Ignacio qualified second for tonight’s final with 2:03.52, just ahead of Keiser junior Joel Hansson (2:03.83). 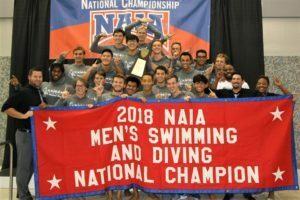 ONU senior Nate Peterson (2:05.20), Keiser freshman Deion Alfajora (2:05.53), Union freshman Henrique Saraceni (2:05.60), Life freshman Gustav Lucas (2:05.61), and Manuel Serrano Laguna of WVU-Tech (2:05.82) were only separated by .62 to qualify 4th through 8th. It looks to be a tight final in the men’s 200 breast. 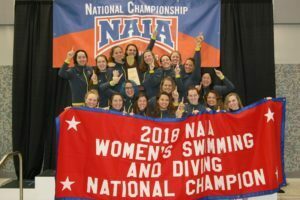 SCAD loaded up the championship final with three 200 flyers and the consolation with one, heating up the race for second place in the team standings where they trail ONU by 35 points after three days of competition. ONU beat expectations, though, with two finalists in this event. Lindenwood-Belleville and College of Idaho provided the other two finalists. ONU freshman Iran Cavalcante-Almeida topped the heats with 1:50.31. He was followed by SCAD freshman Gergely Harsanyi (1:51.42), Lindenwood-Belleville junior Timo Billmann (1:51.52), SCAD freshmen Miles Kredich (1:51.56) and Gergo Zachar (1:51.73), Idaho’s Andrew Clifford (1:51.83), Lindenwood-Belleville freshman Martin du Teilleul (1:52.77), and ONU sophomore Seth Cripe (1:52.89). The only diver in the meet, David Groh assured Cumberlands another 20 points with his 1-meter diving results. Lindenwood-Belleville topped Keiser by .09 to post the morning’s fastest time of 3:05.70. Freshman Josefina (46.88), seniors Paul Elaisa (46.57) and Tim Schmalzreich (46.67), and freshman du Teilleul (45.58) contributed to the effort. Keiser (Nick Oh, Wyatt Engler, Macek, and Stukov) combined for 3:05.79 without Fernander and Nagy, seeded 1 and 2 in tonight’s 100 free final. College of Idaho (Clifford, Dylan Osborne, Cooper Salmen, and Jonathan Jennings) combined for 3:05.82. SCAD (3:06.66), Loyola (3:07.29), Thomas (3:07.38), ONU (3:07.57), and Cumberlands (3:07.62) will make this final event of the night a thrill.